The Story of Christmas, this Norman Rockwell painting, appeared on the cover of The Literary Digest published December 24, 1921. The alternate title for this illustration is Grandfather with Two Children. 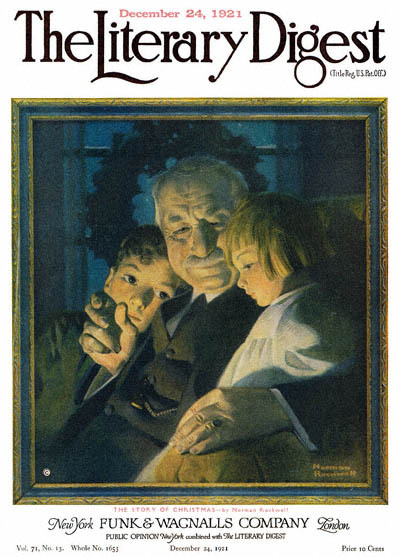 Rockwell artwork was featured on the cover of The Literary Digest twelve times just in 1921. A Rockwell cover was published once a month just on this one magazine alone! This painting was also Rockwell's 33rd overall out of 47 total pictures featured on the cover of The Literary Digest. Rockwell's career with the Literary Digest only spanned five years, from his first cover illustration, Boy Showing Off Badges in 1918 to his last, The Night Before Christmas, in 1923. The original oil on canvas painting, 13 x 12 inches or 33 x 30.5 cm, is part of the collection of the Wagnall's Memorial Foundation Museum. This painting has also been reproduced in Norman Rockwell, A Definitive Catalogue by Laurie Norton Moffatt on page 58. Norman Rockwell uses our emotions to evoke memories of Christmas long past. In this painting, we see two children enjoying their grandfather on Christmas Eve. The Story of Christmas was only one of 47 Norman Rockwell Literary Digest covers; here is the list of more Norman Rockwell Literary Digest scans. Conversely, we also see a grandfather enjoying his grandchildren on Christmas Eve. Most of us remember our grandfather's kindly smile, just as Rockwell portrays it here. Grandfather is enjoying a pipe in his big easy chair by the roaring fire on Christmas Eve. He is delighted by the company of his two favorite children in the world. The glow of that roaring fire illuminates their faces. Most of us who are old enough to be grandparents love to see that look of love and admiration that Rockwell has so aptly captured in that little boy's face. The wreath in the window in the dark background, along with the publication date, reminds us that this is a special night. It is a special night for children of all ages. For more about the real story of Christmas, visit Dr. Ralph Wilson's Joyful Heart.